This time of year, when gardens are in full bloom and the weather is mild, my thoughts always turn to entertaining. There’s just something special about inviting guests into your home to share hospitality and warm conversation. 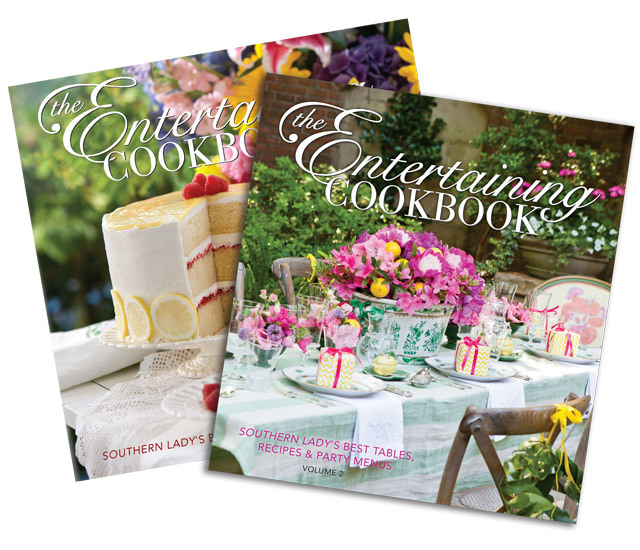 To welcome the season, I’m giving away Volumes 1 and 2 of The Entertaining Cookbook from Southern Lady magazine. I hope that you will find a wealth of inspiration in these beautiful hardcover books, which include recipes and tablescapes for everything from extraordinary morning meals to summer soirees. I will be choosing a winner this Friday, May 13 at 9:30 a.m. Good luck! It is always a pleasure to read your emails and get refreshed because you truly have the ability to inspire us with your knowledge and expertise. The beauty you create with your exquisite publications is certainly appreciated by us all. Thank you, Phyllis. I would be so happy to receive copies of these books. I am so impressed with all your magazines and the way the information and ideas are presented. Thank you for all you do! Love your publications. Thanks for providing us with beautiful magazines. Thanks for the chance to win these awesome books. Put my hat in the ring! I’d love these! Yes, this weather brings out the Entertainment Bug. I’m packing for a tea tour of England, but once I return home, watch out! The books look delectable. Thank you, Phyllis, for sharing the opportunity. I treasure all my tea/party cookbooks! I am not a subscriber of your magazine, but I have certainly enjoyed the emails! Wonderful to have a chance to win these lovely books. I make many dishes whose recipes I have found in Victoria. Gorgeous books! Thanks for the give away! Thank you for the giveaway. As a pastor’s wife, I always look to your magazines for ideas to decorate for baby showers, weddings, dinners, etc…these books would be a great addition to my already growing collection! ! Thanks again!! Absolutely love your publications. The photography is exceptional! I’m NOT very creative but I certainly can copy what I see in your various magazines. Thanks for the inspiration…always! Love your blog and all the inspiration you share with us. Cannot wait each time you post to know we will be learning something new. Entertaining is such a passion of mine and to win the books would be a delight. Thank you for giving your readers this wonderful opportunity to receive this gift. My husband and I cook and prepare events for our church. Our biggest event yet was a sit down dinner for 250 last June. I use your books for ideas. Thank you for the chance to win. Beautiful books. Thank you for a chance to win. I have enjoyed Southern Living and Victoria for many years. In fact I subscribed to Victoria and received the very first issue – a true favorite. Would be delighted to win these two lovely books to add to my cookbook collection. Thanks for the chance to win..
Beautiful books! Thank you for this generous give-away. I enjoy entertaining and would definitely enjoy using these books for inspiration! Just received my new magazine of Cottage Living and shared it with a dear friend. We love your magazines and that all of them are morally family friendly and oh so lovely each time one is received they bring joy. We love that it is a family business and not someone out there somewhere. Bless you for this giveaway from Southern Lady (love the name of this magazine and books) cookbooks…be most joyful to be the lucky winner. But may whomever wins they bring blessings to that home. I have to say that I just gave Volume 2 to my daughter for Mother’s Day and she absolutely loved it! Thank you Phyllis! Lovely offer. I adore all things Hoffman Media. SOuthern girl at heart from the Midwest. Taking a short road trip this coming weekend and I already have my magazines packed. I’m crazy for anything Hoffman Media puts out, and I would love to have this wonderful book. Thanks for the great giveaway! Would love to win these two books. Love to have church ladies night and these would be a great way to try new recipes. We would have a great time planning our next get together. The cake with lemons look soooo luscious and I love tablescapes of all kinds. Thank you for an opportunity to win these beautiful looking books. Books look lovely. The ladies at the garden club would be impressed with my entertaining skills. Love your books and magazines. So pretty and so fresh! The pictures are beautiful and the recipes excellent. Thank You. I Have Been Wanting To Purchase The Entertaining Books. I Have Every Tea Book That You Have Published. I Would Be So Happy To Win. When I was young my mother, would try to teach me to cook ,but I was more interested in telling her what went on in school or the new clothes styles I wanted. After listening to my endless chatter she would say, “Madam Butterfly go land somewhere else so I can finish cooking before your daddy gets home.” My mother passed away 17 1/2 years ago at the age of 56. She was a fabulous cook and a gracious woman. After 17 1/2 years people still talk about what a fabulous cook and good person she was and how they miss her and her cooking. I should have been like the wise old owl who spoke less and heard more, then maybe I could cook as well she did. Most people have heard of a bucket list, I call my list a basket list (it sounds more lady like), at the top of my list was learning to cook like my mother. I had put off everything on my basket list because I felt I had along time to complete it. My thinking was changed in August 2015 with three words, “YOU HAVE CANCER.” I had two surgeries in August and by the grace of God I am cancer free. I still have a basket list which has been drastically shortened and being a good cook is at the top of my list. I realize I will never be a cook like my mother but maybe there will be one recipe I will be remembered for. I did learn to love books, flowers and decorating from my mother. I guess I can multitask after all. I can look and talk at the same time. I have two of my mother’s cookbooks and would be very honored to add these to my collection and hopefully find the one recipe I would be good at making ( and remembered for). I would love to have the entertaining cookbook. I am not a very savvy entertainer, so I think the book would certainly help me. Thank you. I just finished planning a luncheon and used many recipes from Hoffman publications. Your publications are a delight to use. Thank you for the opportunity to win these lovely and useful books. My daughter is working on her degree in Culinary Arts and would love to add these beautiful books to her collection! Amazing things come from Hoffman Media! I know these won’t disappoint anyone fortunate enough to win. Always something wonderful coming from Hoffman Media! I know these won’t disappoint anyone who is fortunate enough to win. Your books and magazines are great sources of inspiration. An added benefit is their beauty. I never tire of the creativity and talent within their pages. Keeping my fingers crossed! Thank you for your generosity. I subscribe to several of Hoffman Media magazines……Paula Deen, Southern Living, Southern Lady, etc. The quality is exceptional. I feel like a transplanted Southern gal living in the Midwest! Love to entertain my gal pals and would savor these books. Thanks for your magnificent publications. Such beautiful books! I enjoy my subscriptions to Southern Living and Southern Lady and have given subscriptions for gifts the past several years and friends have become devoted to these publications. Would enjoy these books and sharing them with my friends. Thank you for the opportunity to win these amazing books. Every magazine that I subscribe to as well as every book that I’ve purchased from Hoffman Media has been top-notch! Thank you for the opportunity to win these beautiful books! What a treat. 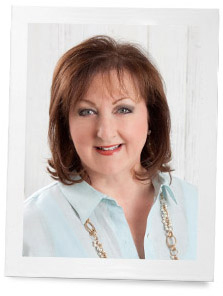 Entertaining is my passion and Southern Lady and Victoria magazines are my go-to sources. It would be a delight to own these books. Hospitality is one of my gifts, and I’m always seeking new, bright and beautiful ideas. The entertaining books would be a perfect way to celebrate the remaining days of this year! Your recipes and entertaining ideas are the best. Such lovely books! I love to entertain and these would be an inspiration. Please enter me in your giveaway. Thanks for your lovely blog and magazine. You are the epitome of a gracious hostess as always. I would love to win these books. I don’t cook at all. The best thing I make for dinner is reservations. The only reason I have an oven is because it came with the house. That being said, my sister is retiring in a couple of weeks and I would love to give these books to her. She cooks all of the time. These look absolutely beautiful. Would be a great gift for my daughter who loves to entertain. Excited about these two books! Thank you for the chance to win. These books are very exciting, having new ideas for entertaining family and friends would be fantastic. I hope I win! Thank you! I’ve love to have these books. I want to entertain more and the ideas are always wonderful. These books are beautiful! I would love to win. Thanks for the chance to win this!! It looks like a wonderful book to own! These two books are wonderful inspirations for parties and making guests feel welcome, entertained, and the hostess gets to enjoy the events, too, with a little guidance and lots of organization. All of your books are beautiful and provide great inspiration and direction to give our own special occasions unforgettable food and decor. They are lovely to look at, and filled with wonderfully, delicious recipes and decorating ideas. Thanks so much. I would be happy to just win one of these and let another lady have the other. In this crazy world !next to my Bible I find such pleasure in all of your publications! Thank you, I’m a kindred spirit! Would be a wonderful addition to our new house were building. Looking forward to meeting new neighbors and entertaining. Please please, let it be me!! I am expected to entertain and I am stumped for ideas. I “borrow” so many ideas from Victoria and Southern Lady, I’m sure that I’ll be set with entertaining ideas for a long time!! Thanks for a chance at these beauties.. The photography in your publications is always so beautiful. Please enter me! of mouthwatering cake from the other cover! Yummy and delightful. Yes, please enter my name for your beautiful books, I treasure them all. The photographs in the books would certainly keep me happy for hours as well as offer great ideas for entertaining. Thank you Phyllis for the generous offer! I sooo love see “ribbon” in my email!!! It’s always like….. A call from an old friend….. Please add my name to the give a way list…. And thank you as always for your “visit”. This a book that anyone would treasure. It would be like any other publication by Phyllis and Hoffman Publication. A book or magazine that is opened many times to enjoy for pleasure or for information. A joy to own!! I would like to be entered in the contest to win these two fabulous entertainment books. Would love a chance to win these books. I don’t know if I have a chance living in Canada but would certainly be appreciative!! There is always something new to learn and these books would be very helpful. Thank you for the giveaway. Entertaining friends is my joy….belonging to several luncheon bridge groups….we all work at making our gatherings a special occasion. So I am always looking for fun tablescapes and interesting menus . I would be thrilled to receive one of these books and would certainly put it to good use. Always enjoy your lovely publications and would really appreciate these gorgeous books. Love your magazines and your blog, so I know I would love these books as well! Thanks for the opportunity. I know these books will be great and do enjoy any HM publication. Thank you for the opportunity. I love to entertain, being an innkeeper/owner of a Bed & Breakfast, I’m always looking for new fantastic ideas when cooking for my guests. I would love to win the two volume set of Southern Lady Magazine “Entertaining Cookbook” Thank you Phyllis, for giving me the opportunity to win these lovely books. They would be a great addition to my collection. And, magically, guests are swept into a world of beauty and tasty foods prepared by you! To have them on my kitchen counter would offer my family the feeling of glee! I look forward to The Ribbon in My Journal daily and love your ideas. The Entertaining Cookbooks are beautiful and would be a great addition to my collection. Thanks for a great giveaway and great publications. Beautiful books would love them. I had a tea party for my friends and their mothers in my backyard two weeks before mothers day under the shade of my beautiful maple tree. The following week and freak windstorm came through and knocked the big beautiful tree that I planted 32 years ago down to the ground. I am so heartbroken as that tree was the center of my garden. My hammock was there – it was my secret gypsy garden with flags and mirrors. I am going to miss it so much it makes my heart heavy – I will have to change my entertaining style now these might help. Love all your books and magazines, and have all the “Victoria” magazines since 1988. I refer to them a lot. Also, the hardback Christmas Books which I look at year around to get ideas and inspiration. I would love to win the Entertaining Books. Also, used tablescapes, recipes, and many of the other ideas for our Christmas Tour of Homes. Thank you for the chance to win these books! I would love to win these! I love your Ribbon Blog….so inspiring in many ways! These Entertaining Cookbooks look amazing and would be so helpful to me. Thanks for the chance to possibly win them! Lovely books! I would be delighted to receive them! Beautiful books! Looking forward to entertaining with your help! All of your books are beautiful.! The covers of these books are beautiful. Thanks for the chance to win them. It would be countless hours of enjoyment. What a treat these are. Always look forward to new issues! These look stunning, Phyllis…definitely works of art! Thank you for continuing to inspire us. These books are beautiful! I would love a chance to win. Thanks! This is the third year my sister and I have planned and promoted a “Festival of Tables” at our Church, with the help of our United Methodist Church Women. This is so much fun, and at the same time a lot of work! This is a fun event, with beautiful tablescapes, great food, and entertainment. I have pulled out all my entertaining issues of Southern Lady, a great help in the planning. I know the books would also be a great help. Thanks for the chance to win! Thank you, the first book is amazing :). I cannot wait to see the latest. Thx for the chance to do so !!! Oh my, I can see myself spending hours browsing through these gorgeous books. Over the years, I have been inspired by all the incredible beauty and creations featured in your lovely publications. Thank you for such a gift. Would love these two books to add to my collection! I love to entertain and I love to read entertaining books and magazines. What a double treat this is. Thank you as always for your interesting posts and fun contests. Love all the Hoffman books and magazines. They are wonderful resources for entertaining. Thank you for the chance to win! These two books will ensure that people will love to come to your house for the warmth and love (and FOOD) for which the beautiful South is known! I love Hoffman media! I would love to win them! I just love Hoffman Publications . . . What a nice gift to welcome the season! Thanks! This July, my sister and I celebrate 55 years of living and we were my Father’s “gift” for his 25th birthday. These books would help plan the party. The books look beautiful! I would really enjoy discovering the wonderful recipes and the beautiful entertaining ideas in these books. I love planning family gatherings and sharing delicious food, lovely tablescapes, and making memories! Thanks for the opportunity to win these books! What beautiful covers on these books. I’m a southern girl who moved to Nevada eight years ago. Oh who I miss all things southern. At times my mailbox is full of grits, country ham, Dukes, and flour. I have been know to pack sausage and fatback in my suitcase to bring home when I visit. Thanks for the chance to win these beautiful books. They would certainly take me home. Oh, I would love to win these two wonderful books! Thanks for the opportunity. Thanks for the opportunity at a chance to win these lovely books. I love to entertain. Happy Summer Days! Love all the Hoffman Media publications. They are not only educational with wonderful recipes but a true delight to the eye. Thank you for the opportunity to win these wonderful entertaing books! I love everything about Southern Lady, I’m sure I will love everything about these books too. My figures are crossed! What pretty books. Always enjoy summer entertaining on my screened-in porch. Thank you for the opportunity to win. Good Morning. I’m just beginning to peruse magazines and books, and am jotting down decorating ideas and recipes for three summer tea parties that I offered as silent auction items. I would love some fresh ideas. Thanks so much. I always look forward to seeing “The Ribbon In My Journal” in my incoming email! It gets my day off to a wonderful start. What a treat it would be to win these two beautiful books! Love Hoffman Publications. They present a gentler, kinder world that we all want to attain. These books would be a wonderful addition to my cookbook collection. I enjoy entertaining and making scrumptious food and setting a lovely table for my guests. Many ideas and recipes come from Victoria and Southern Lady magazines. Looking at the covers of the two books make me hungry. Should I be the lucky winner, I will pass them along to my granddaughter who was a bride in May of 2015. She would love them. I could never have too many cookbooks. I actually read them at night in bed looking for wonderful new recipes. I would spend countless hours perusing these books! I would love to win The Entertaining Cookbooks! I love all your books and ideas. I would love to win these two beautiful books. I have your tablescapes book and I refer to it every time I entertain.